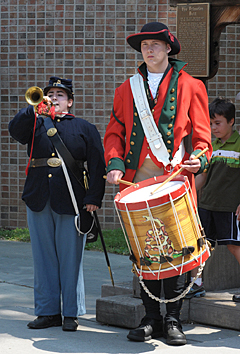 SPIRIT OF PRINCETON: Two wars were embodied by the bugler and the drummer during the Spirit of Princetons Memorial Day ceremony at Borough Hall honoring the late Frank Tylus, a lead coordinator of past Memorial Day parades. The primary elections scheduled for next Tuesday, June 2, will allow voters in Princeton to select their choices for either Democratic or Republican nominees for Governor, General Assembly, members of the Board of Chosen Freeholders, and both male and female members of the State Committee. After much debate in a recent meeting, Borough Council voted to issue a request for proposals (RFP) that would seek an independent consultant to assess personnel management within the Police Department and also to evaluate the role of the governing body and public safety committee vis a vis the police. A diminished materials budget may account for a drop in gate count numbers at the Princeton Public Library during the early part of 2009. The library accumulates both gate count numbers  people entering the library itself  and door count statistics  those who simply enter the building. After 74 years as a Chrysler Dealership, Belle Mead Garage, is one of nearly 800 Chrysler dealers across the country (40 in New Jersey, with a possible loss of 1500-1600 jobs) to lose their franchise. Its a good thing that Selections, the current Peg and Frank Taplin Gallery exhibit in the Paul Robeson Center for the Arts, runs until July 3. For a single-room exhibition, theres a lot to see, and viewers may well want to return more than once to contemplate the very different kinds of work on display. Allegra Formento was thrilled to join the American University womens lacrosse program in the fall of 2007.